Before moving on any further with the ATOM (abductive theory of method) as used in case formulation, I need to define what is data and what is phenomenon. Haig defines data as individual pieces of information, often unique to the person or situation, whereas phenomenon are patterns amongst those pieces of data that form distinctive features. For example, difficulty getting off to sleep, lack of energy and poor appetite are data; when they’re tied together with tearfulness and feelings of guilt and poor concentration, and occur over the period of at least two weeks and are causing problems in work, home and social life, we can call it part of a pattern that we recognise as depression. Data are the evidence for the underlying phenomenon, they’re visible or reportable, but in themselves are not patterns. In the case of chronic pain, there are so many variables that could be affecting an individual’s presentation, that it’s vital to take some time to really listen to what the person is describing. By doing this we are clinically sifting through masses of data, looking for patterns. Does this person repeatedly avoid certain movements? Does the person describe certain physiologic symptoms? Are there patterns of response to certain people or interactions? Revising from the last post I made, the first step is to collect some data, and the second part of that step is to reduce it and look for patterns. In looking for patterns we’re also searching for reliability of that information – does it come from several sources, how do they agree or differ, is it stable over time and place? To find this out we usually use information from more than one source such as the person, any questionnaires they’ve completed, any testing we’ve done, observation, and hopefully with other team members and the person’s significant others. The next step is inferring causal mechanisms for the phenomena or patterns that have been identified. 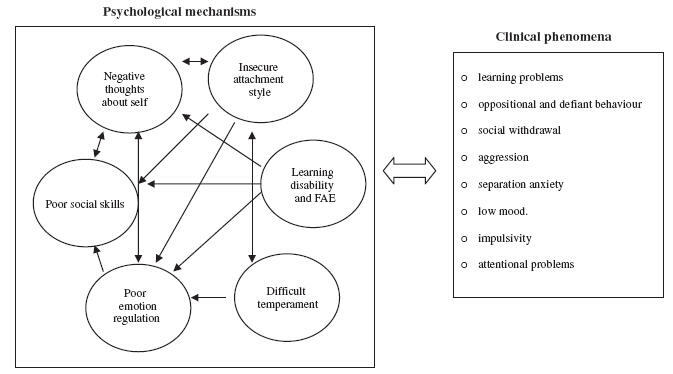 Most times clinicians work from a basic framework or theoretical orientation such as the biopsychosocial model, but adopt specific theoretical models such as operant conditioning (pain behaviour being reinforced), cognitive (eg schema, cognitive distortions), affective (eg attachment styles, emotion regulation), biological (eg central sensitisation, cortical organisation), or a combination of these. These theories are usually from the clinician’s ‘existing knowledge base of empirically established relationships between psychological mechanisms and behavioral patterns.’ In other words, clinicians draw on their knowledge of the literature, and their clinical experience to develop potential explanations for how and why this person at this time has developed these problems. Given that the explanations generated are still hypothetical, it’s necessary to test for these relationships to confirm or disconfirm how well they explain the person’s presentation. Vertue and Haig suggest drawing the possible relationships in a graphic form to help generate links between various factors. Being a visually driven person myself, I find it helpful too – and helpful when working with the person with pain. Whew! What does that mean? It should describe what you see, what the person reports, how the situations arose, what’s keeping it that way, what the likely future is, and what treatments should be applied.